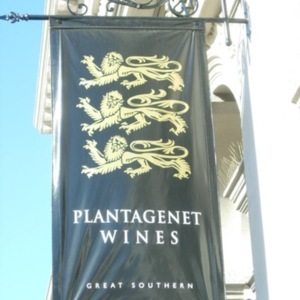 Plantagenet Wines have a winery near small rural Western Australian town of Mount Barker in the Shire of Plantagenet. They also have an office in the Perth suburb of Fremantle, where this photograph was taken. 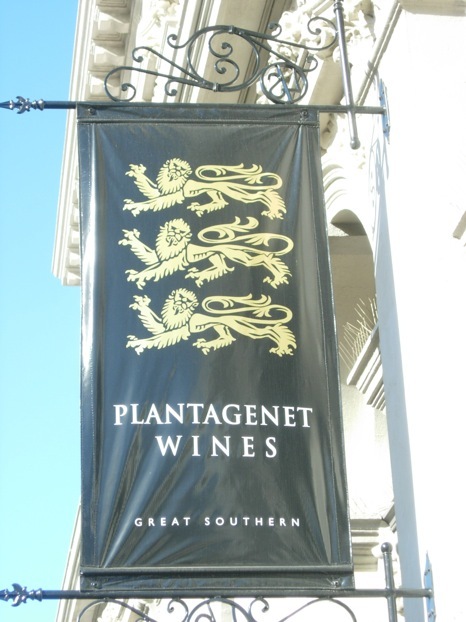 The banner depicts the company’s label, also found on their wine bottles, which depicts three lions known as lions passant (walking) in heraldry. The design is based on that used by the Plantagenet dynasty, beginning with King Richard I (the Lionheart) of England (1157-1199). The three lions on the coat of arms of the Plantagenets had blue claws and tongues. The design is also known as the Royal Arms of England. “Plantagenet Wines,” Medievalism in Australian Cultural Memory, accessed April 23, 2019, http://ausmed.arts.uwa.edu.au/items/show/838.